This says it all about the state of evangelical Christianity in Jacksonville: the largest and fastest growing church in our city, Celebration Church, is having none other than prosperity preacher/millionaire Joyce Meyer in to speak at a conference. 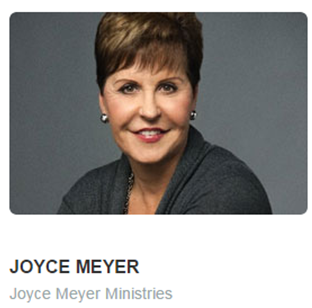 For only $129, YOU TOO can go and hear Joyce Meyer speak to church leaders. Yes, Stovall is giving Joyce Meyer a platform in our city to speak to church leaders and church wannabe leaders. Do we really want Joyce Meyer here to speak in our city? Meyer and her money-making enterprise (known as her "ministry") were investigated by Senator Charles Grassley's Senate Finance Committee back in 2007 and 2008 for possible tax violations. Grassley focused on whether Meyer and five other "ministries" improperly used their tax-exempt status as churches to lavishly enrich themselves and their families. It is a travesty that Stovall brings Joyce Meyer to our city. She represents everything that is wrong with evangelical Christianity. Her board is made up mostly of family members. Most of her kids and their spouses are on the payroll. She has a net worth of around $25 million and her ministry spends a tiny fraction of their revenue on actually helping anyone. But I've said it here multiple times: Stovall himself preaches a prosperity gospel, so this doesn't come as a complete surprise to the Watchdog. Welcome to Jacksonville, Joyce Meyer. Hope you don't stay too long. Today Lifeway is introducing a new bible translation to help preachers and churchmen teach the important first-fruits storehouse tithing doctrine to their church members. The translation is called the "Revised Storehouse Tithing Bible", or RSTB for short. "We have sought input from some of the best fundraising pastors in modern evangelicalism to provide this valuable resource to pastors as they teach the sheep the absolute necessity of forking over a minimum of 10% to their local church", said a Lifeway spokesman. Contributors to the RSTB include Steve Gaines, Ed Young, Frank Page, and also John Hagee. Robert Morris, best-selling author of The Blessed Life and storehouse tithing teacher, was the editor of the project. 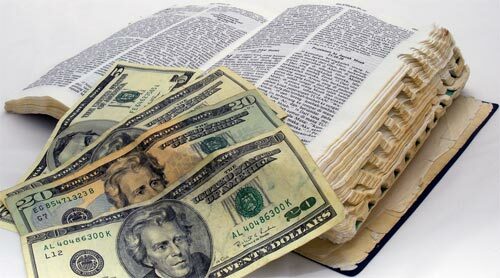 Lifeway says the RSTB will help church members see that tithing really is a common theme found throughout the Bible. "Just as the tapestry of red, Christ's redemption, is found throughout scripture pointing us to Jesus Christ, so on every page of the Bible we find the first-fruits storehouse tithing principle, the blessed 'tapestry of green', that points Christians to securing God's blessings and avoiding God's curses through giving the first 10% of our income", said one of the RSTB editors. The RSTB has several unique features: it is color coded - verses having to do with storehouse tithing are highlighted in bright money-green. Also, unique tithing icons are used throughout, such as those highlighted verses that refer to Christians getting blessings for their tithe are marked in the margin with "$" symbols, while those that speak of God's curses for not tithing are marked with either an icon of a purse with holes in it or a devil's pitchfork. To help Christians fully understand how important it is to tithe to avoid the wrath of God, the RSTB includes modern-day translations of verses dealing with first-fruits tithing principles that have been uncovered in scripture by the today's evangelical tithing experts. Old Testament verses have been interpreted to aid Christians in seeing that the modern day church is the temple, and that their pastors are the modern day equivalent to the Old Testament priests. Lifeway acknowledges that the RSTB will have its critics, but that these are mostly recalcitrant bloggers who don't tithe anyways. One such critic, FBC Jax Watchdog, says he offered the RSTB translation team a helpful modern day translation of Malachi 3, saying that it is the most misused verse in the bible on storehouse tithing. "They weren't too interested in receiving a modern-day translation of Malachi 3 that reflects how God would apply it today to the church", said the Watchdog. "You see, what the storehouse tithing preachers don't want you to know is that the book of Malachi was directed at priests of Israel and the sons of Levi. So in Malachi 3 God is upset that the priests, not the people, are misusing the tithe and thus robbing God."